The benefits of birth name numerology is determined and calculated by totaling the day, month and the year in your date of birth. Our life is decided by the position of the planets at the time we are born. Each numbers has each planet and that planet has friendly planet and enemy planet. Benefits of birthday are determined with them. 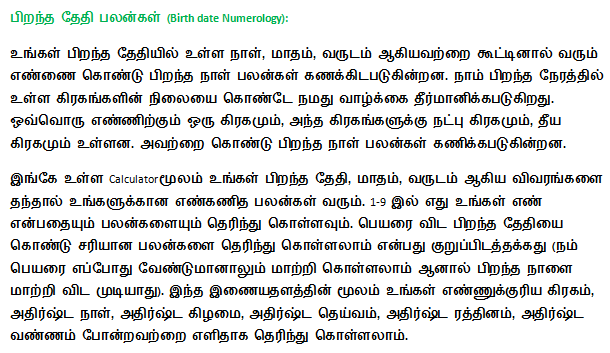 Give your birth day, month and year in the calculator in here to get your numerology benefits. You will know your number among the numbers 1 to 9 and benefits. With your date of birth you can know the exact benefits than with your name (we can change the name but not birth date). Through this website you can easily get information like your numerical planet, lucky day, lucky god, lucky stone / stone and lucky color.